Powerful 2.200 W motor. No load speed 1.300 RPM. Fitted standard with a 14" (355 mm) 80 Teeth “long life” TCT-tipped blade. Produces clean, virtually burr-free cuts on steel, copper, aluminum and plastics. Adjustable cutting angle 45° - 90°. Quick-acting clamping system for fast operation. Spindle-lock for easy blade change. RIDGID TCT Saw Blade for 590. Tungsten Carbide Tipped Saw Blade. Professional TCT saw blade, designed to cut steel, copper, aluminum and plastics with a maximum wall thickness of 6 mm. 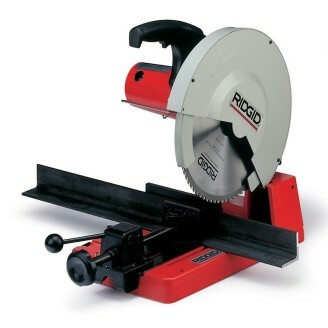 RIDGID TCT Saw Blade for 590L. 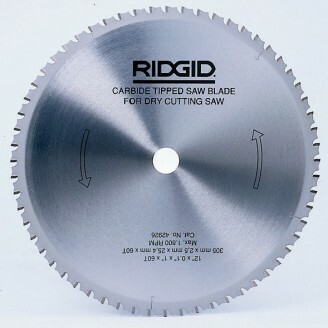 Tungsten Carbide Tipped Saw Blade. Professional TCT saw blade, designed to cut steel, copper, aluminum and plastics with a maximum wall thickness of 6 mm.